Yes, I know, I’m a bit late with this one – but here it is! Findings from the Wood: March. 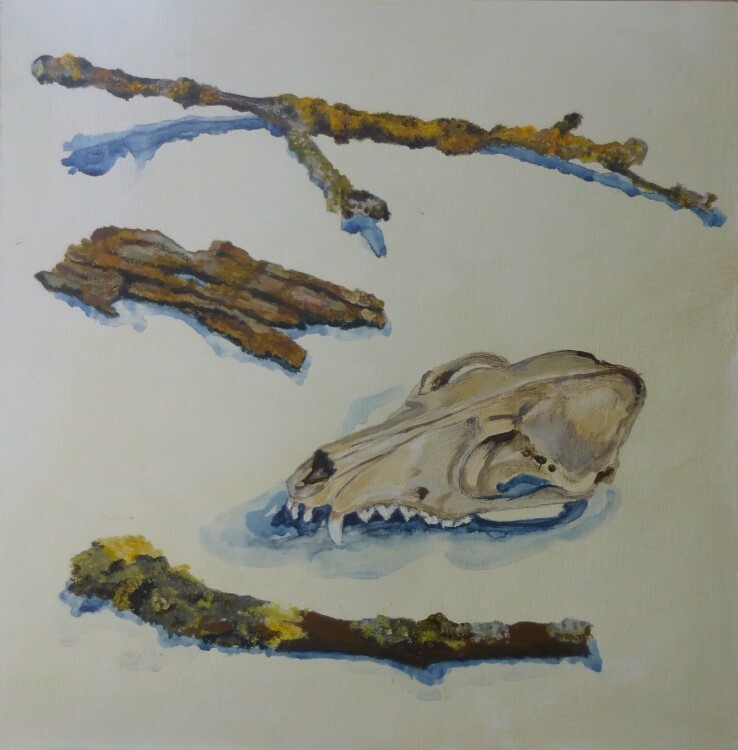 The fox skull, oak bark, and heavily lichened twigs. I’m hoping, if it doesn’t rain for the next few days, to make my April visit to the wood this week. The bluebells in my garden are just about out – a good sign! I would like the April version of Findings from the wood to be a bit more spring like – I’m thinking bluebells, and new leaves! In fact I keep dreaming up different techniques I might use to paint the bluebells . . . . I did a bit of prep for the April big painting this afternoon, and got the next 2 foot square board primed with its first layer of gesso primer. We are so busy with preparations for the Festival at the moment, that I feel I have to get ahead in any little ways I can! I’m going over to East Bergholt later in the week to collect Penny Bhadresa’s beautiful lino cut prints, and last night I had an email from Jonathan Trim with some very exciting photos of the paintings that he is putting into the Festival exhibition. Tickets for our evening events are selling well, particularly for James Russell’s lecture ‘Eric Ravilious and Edward Bawden: An Artistic Friendship’, and in between times Graham and I are rushing about delivering Festival leaflets, and finalising details of how art work will be displayed, and making up rotas of helpers . . . . we’ll get there! 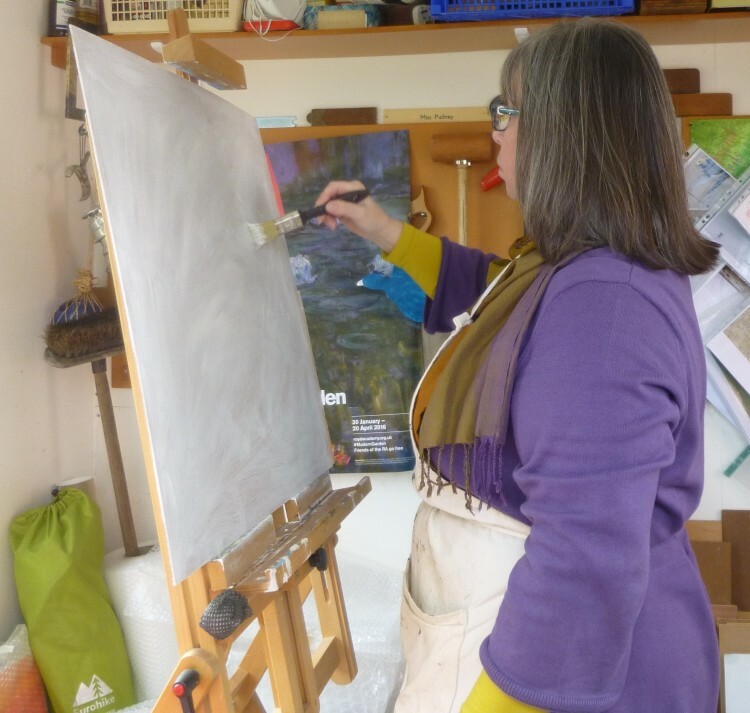 All the details are on the website – www.lexdenartsfestival.org.uk – where you can also purchase tickets for any of the evening events. Yesterday afternoon Graham and I went down to the Sentinel Gallery to have a look at their new show, which is four landscape artists, including our friend, Nat Young – who has some very appealing small paintings in the show that looked very fresh. I thought the gallery looked lovely – the selection of work all seemed to fit together well – and we particularly liked some intriguing ceramics by Annabel Faraday which are printed with digital images, and some of Dina Southwell’s vibrant landscapes. The show is on until the end of April, and is open Wednesday to Sunday – well worth a look!